Cleansing in the lead up to Summer but finding it hard when you’re on the go? You don’t have to miss a Cleanse Day! Whether you’re catching a plane, planning a road trip or just running around after the kids, cleansing whilst on the go can be simple and seamless with just a little preparation. Pack your Cleanse for Life™ powder canister in your carry-on luggage or handbag and simply mix together in your IsaShaker when it’s time for a cleanse. Liquid Cleanse for Life is also available for purchase so you can pre-mix your cleanse before heading out the door. We also offer a range of satisfying and delicious cleanse support products that help combat hunger and fatigue that you may experience on your cleansing journey or whilst travelling. Whey Thins™, IsaDelight™ and Isagenix Snacks™ are available in a variety of flavours and can be enjoyed guilt free and on the go, too! 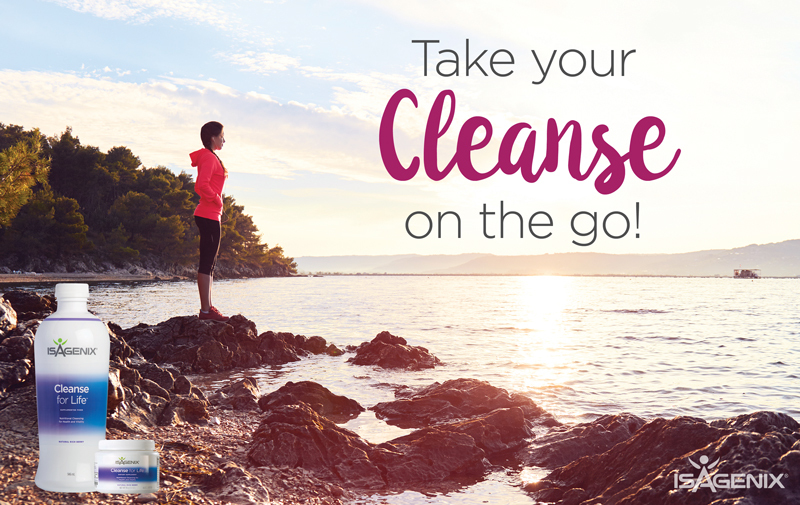 With a little preparation, you can cleanse anywhere at any time – there are no excuses when it comes to your health. We recognise that no two people cleanse the same way. Cleanse for Life and the cleanse support products makes it simple and easy to customise your Cleanse Days to fit your health and wellness lifestyle. Head to your Back Office to stock up on your Cleanse Day essentials today and breeze through Cleanse Days like a pro no matter where you are.